Steel members of civil engineering structures undergo degradations mainly due to corrosion and mechanical fatigue. In this context, non-destructive inspection techniques using mechanical guided waves have potential to monitor these structures. Even if wave propagation is not yet fully understood in these structures, useful results can be derived for inspection methodology by using wave modeling in cylindrical waveguide, embedded or not. However, further improvement can be expected from the development of wave propagation simulation tools for real-life structures. 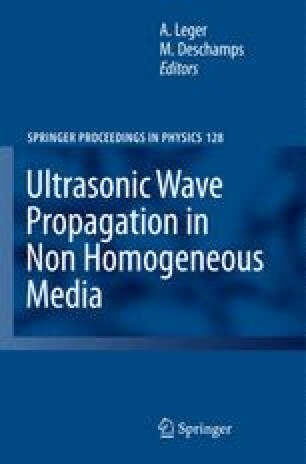 Indeed, several difficulties arise in the understanding of guided ultrasonic waves in such structures, partly due to the helical geometry and the inter-wire coupling effects. Moreover, these structures are pre-stressed and can be free or embedded in solid material. This paper shows some recent research results at LCPC. A first part deals with experimental results on the guided wave propagation in a commonly used steel member, the seven wire strand (i.e one straight single cylindrical wire surrounded by six helical wires). The second part aims at numerically investigating the propagation of elastic waves in free helical waveguides. A numerical method is chosen based on a semi-analytical finite element technique that relies on a specific non-orthogonal curvilinear coordinate system. This system is shown to be translationally invariant along the helix centerline so that a spatial Fourier transform can be explicitly performed along the axis to reduce the problem to two dimensions. The method can thus readily be used for the analysis of helical structures by considering the special case of no curvature. Results for single straight and helical wires are first computed. A dispersion analysis for a seven wire strand with simplified contact conditions is then performed.